Day 243. 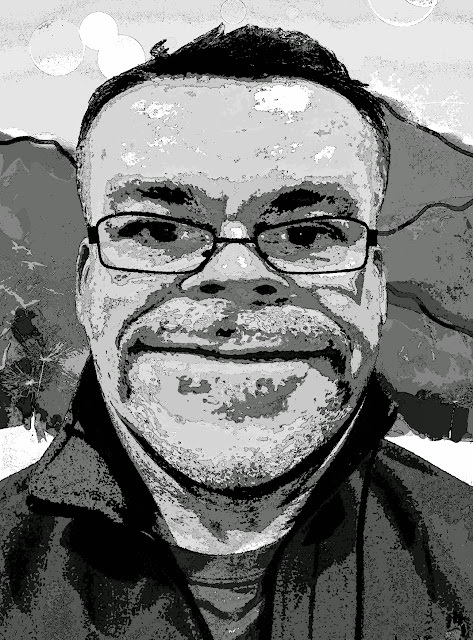 I took my own photo in an app called Face Goo, which lets you stretch and distort an image as though it was on a sheet if rubber. Once distorted I opened the image in Photoshop Mix, an Adobe app that easily extracts an image from the background and lets you put a different background in its place. The background art was drawn in Repix. Then the whole lot was exported into Photoshop Touch and had a series of filters and effects applied to it, and this is what I ended up with. Day 241. 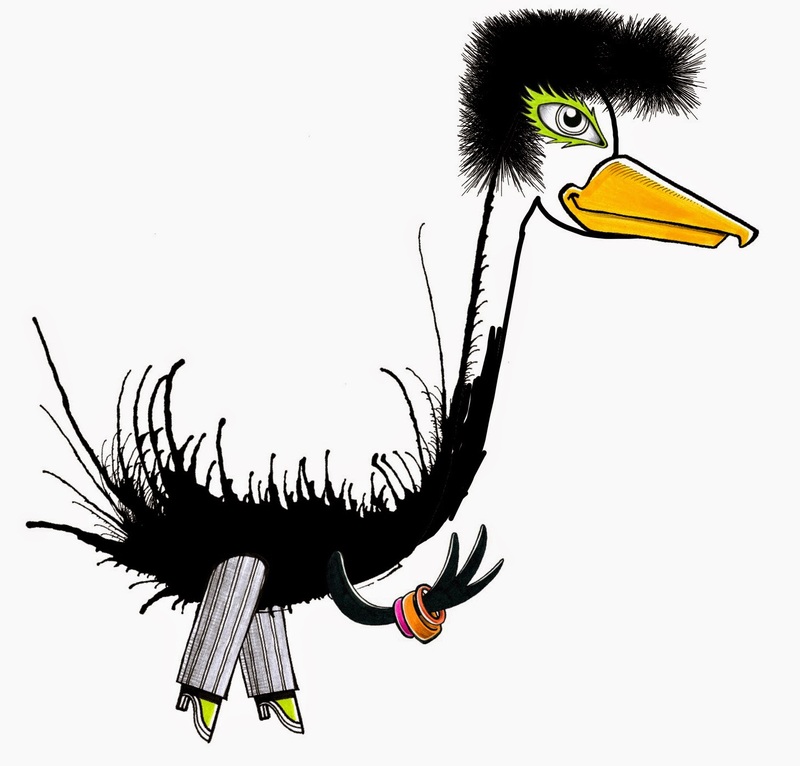 This strange creature was made using the app Daily Monster. It's odd what comes out when you just play around with shapes and bits and pieces. Day 239. I found this neat app called Animation Studio (free today in the App Store!) and while the UI is definitely a bit old school, (woodgrain anyone?) it appears to be quite a powerful animation tool. This little sample was just my first attempt at making something with it... I'm sure with a bit more time and experimentation and a stylus, I could cone up with something quite cool. It exports as a video, and I then used an app called 5sGIF to turn it into an animated Gif file. Day 237. A student of mine visited the Museum of Contemporary Art recently and showed me a series of photos she took there with her new fisheye lens.I particularly liked this one, so I thought I'd make something similar, because, well, everything is a remix. 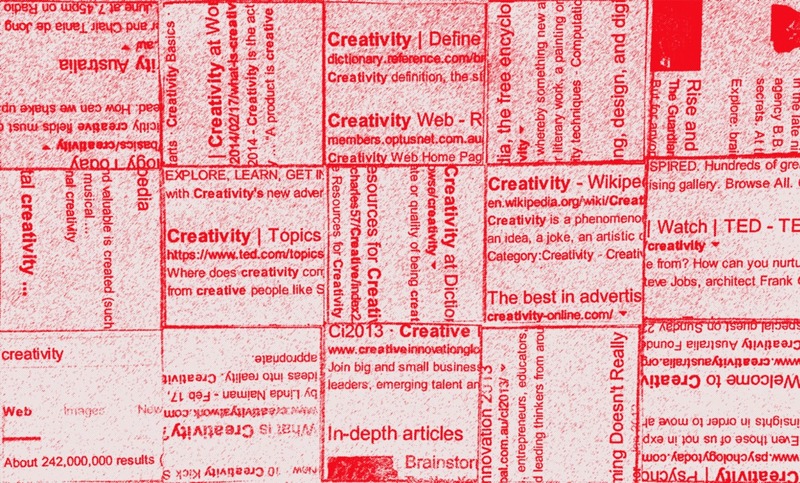 So I printed this page of Google Search results for the word "creativity" then got a ruler, pencil, scissors and glue, cut up the paper and glued it back together like this. Then I photographed it with my Nexus 5, manipulated it a bit in Photoshop, and here is the result. Day 235. This is Peter, the guy who cuts my hair. 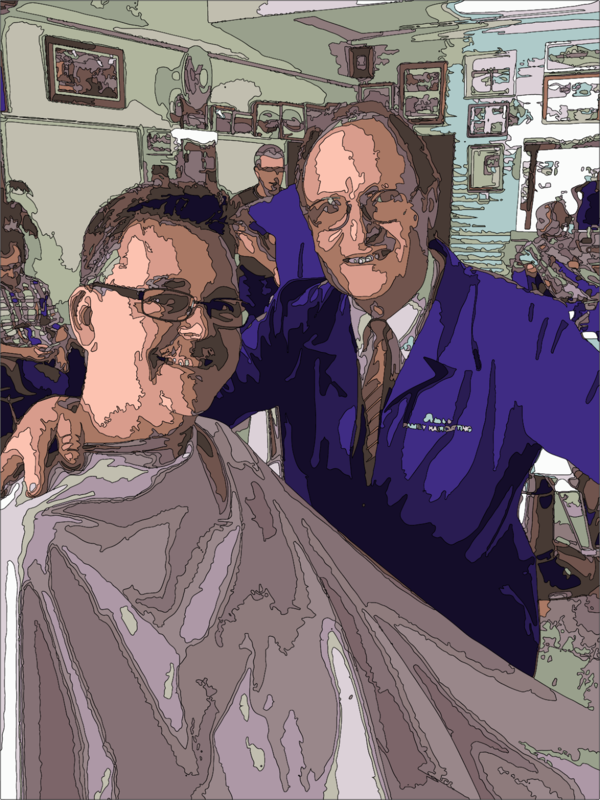 Peter started cutting my hair over 20 years ago, although there were a few years in the middle where I moved away and got it cut elsewhere. Anyway, enough nostalgia, this image was made as I was messing around in Illustrator with the Trace Image options for turning a bitmap into a vector. I still don't feel like I actually know what I'm doing with this tool, but it's interesting to play with it. Day 232. 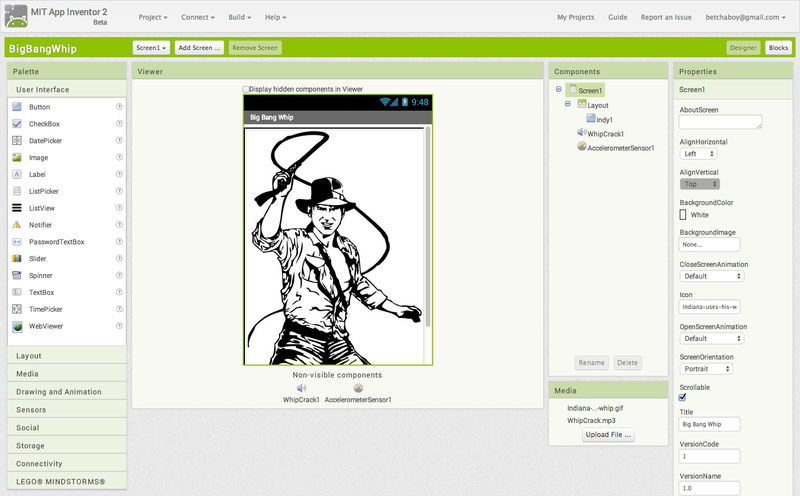 I've been dabbling with Android App Inventor 2, (thanks Kevin Brookhouser!) and wow, what a huge improvement from version 1! This is so much more usable, and easy to get started with. If you're on the same wifi network it just connects to your phone, runs and compiles with no need to futz about with Java runtimes and so on. It fantastic. I plan to learn lots more about this, but here's just a really simple project I made based on an idea that Kevin showed me. You may have seen that Big Bang Theory episode where they have an iPhone app that makes a whipping sound? There are a bunch of these apps in the App Store and Play Store, but why not create one more? I built my own app for doing this. Day 231. 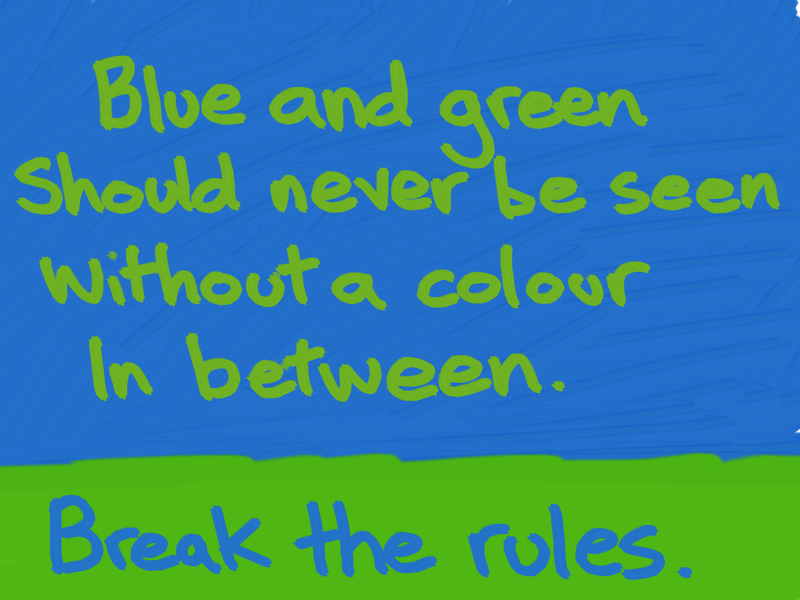 More messing around and creating in Scratch today. This little Scratch program uses code to make hand drawn flowers appear. Click the big green flag button to begin, then every time you click on the stage a new flower variant appears. There is randomness in the size and colour of the flowers. Press C to clear the garden and start again. Day 230. I ran a Scratch session at the III conference on Friday and we made a simple racing game using some random numbers to control the speed. I was playing with that idea a bit further today and made this new improved version that has a few extra bits. Press the green flag to begin then the Spacebar to start the race, R to reset it, and Z to zero the scores. This could be used to learn about probability, as well as a number of other mathematical ideas. Day 229. I got a chance to share a little about my Daily Create project at the Ignite, Innovate, Integrate Conference in Melbourne on Friday, where I was invited to give the closing keynote. It was fun to share this project and I'm thrilled that something I'm really doing for my own reasons seems to resonate with so many others. "I attended the Kingswood conference today and like so many others I was incredibly motivated by what you shared. So...just in case you are ever out of inspiration or time I have attached a 'drawing' for use should you need it along your journey. Creativity drives creativity so surely, you can be permitted to include the creativity of others you have inspired to create along the way! On the off chance you ever use my dabble in the ways of linking technology you will also need to credit Tim Minchin with the words. I choose this as my grade were practicing singing this song whilst I was away from school practicing being creative with you today. 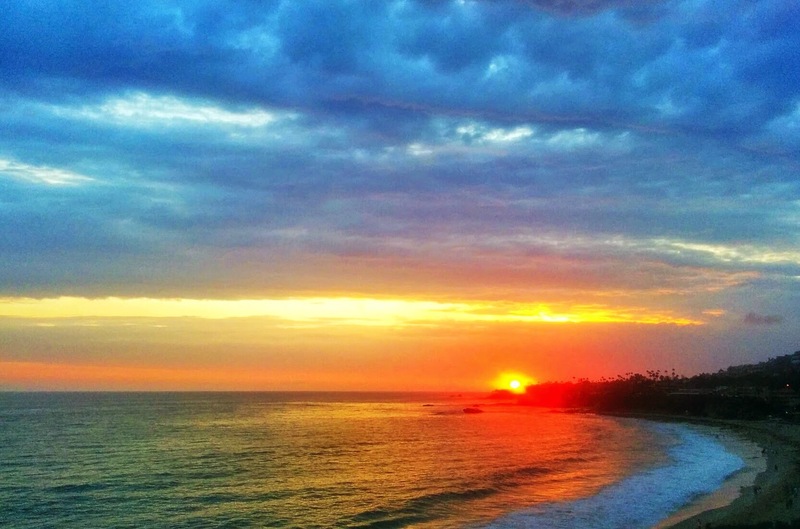 Loved every minute!" I'm humbled by the idea that something I've done might have inspired someone else to do something which they then offer back to me as a way of closing the loop of sharing. It's a lovely idea. So Sarah, thank you (Tim too!)! I wasn't sure whether using someone else's work should be allowed to count as my creative act for the day, but then I though it's my project, so I make the rules. And I say yes! Day 228. One of the many hats I wear is being a member of the global EdTechTeam, the folk responsible for running the Google in Education Summits. Along with my colleagues Jim, Wes and Kimberley, we look after Summits in the Asia Pacific region. The next one we have planned is for Melbourne in September, and part of my role is to create the promotions for the event. So I created this flyer using a web 2.0 tool called Piktograph. It's easy to use and does a pretty nice job of helping make decent looking flyers. As an aside, getting the word out about these events is always a challenge. No matter how much we try to get the information out, we inevitably run into people who have never heard about the event. Or worse, they hear about it after it's over and then say "if only I'd known!" 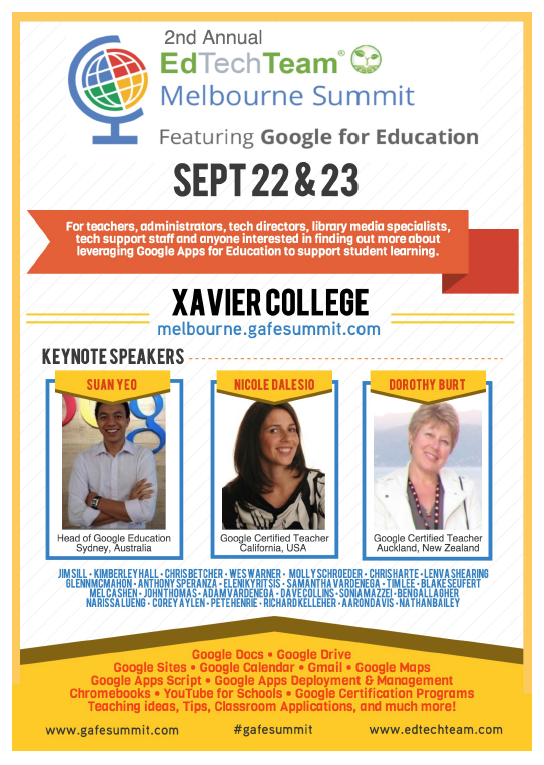 So if you're near Melbourne, and you know a teacher who might be interested in a fun filled two days of Google goodness, can you pass this post on? Thanks. Day 227. After yesterday's daily create of some fairly funky music with a heavy downbeat and bassline, offset with synth and wahwah guitar, I realised that I often use the same kind of approach to writing music in GarageBand. Start with drums, lay down the bass track, then build up with guitars or keys or more drums. Today I wanted to try building a music track in a completely different way, since part of the daily create process is about trying new things and not falling into the trap of doing things the same way every time. Mix it up. Do the opposite. So in this track I didn't use drums and bass at all, instead starting with strings, and building the sound in layers. Its different and I quite like it. Day 226. I had the pleasure today of working with some year 5 and 6 classes at Holy Family Primary School in Canberra. We got to do some creative stuff with the iPads, and one of those things was learning to compose music in GarageBand. As I was demonstrating how to get started I threw these tracks together, and quite liked the groove it created, so I finished it off on the plane this morning. Enjoy. Day 225. I was walking the rather deserted streets of Queanbeyan tonight and I spotted this lovely juxtaposition of geometrical shapes embedded into the footpath outside the Royal Hotel. 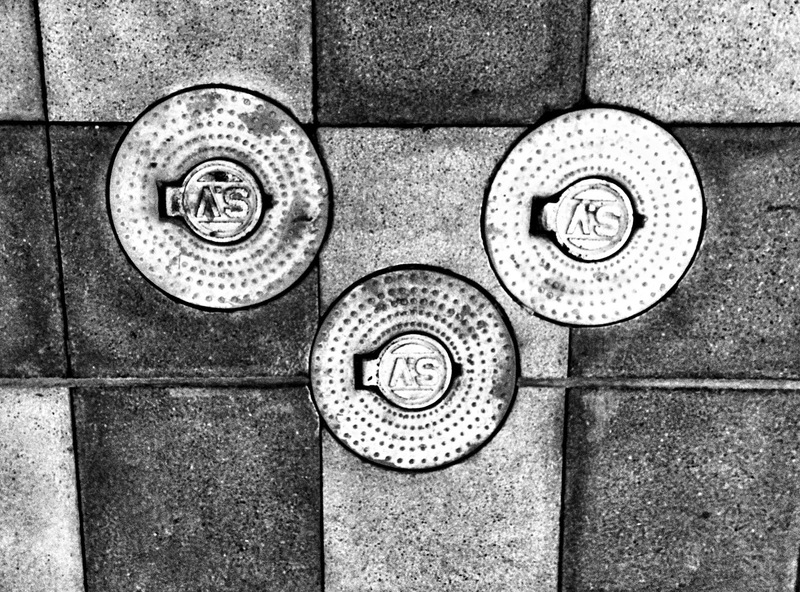 After a bit of tweaking in SnapSeed to add some depth and drama I rather like the contrast of the black vs white, and the round vs square. Day 224. This friendly little fellow is the result of my first play with an iPad app called Daily Monster. After splashing around some virtual ink, you dress it up with features. I need to play more with this one... I think it could be fun for the kids. And a great way to use some imagination and randomness. Day 223. Politicians should never be allowed to make any decisions about the Internet. Ever. Some of the stupidest, most idiotic, misguided comments I've ever heard about the Internet come out of the mouths of the people who are supposed to be making intelligent decisions on our behalf. This track is a collection of quotes made by George Brandis, an Australian Liberal Senator and the current Australian Attorney General. And apparently a complete moron when it comes to the Internet. If it were not for the fact that these people are actually running the country, it would be funny. But it's scary and pathetic. Day 222. Another attempt at drawing with the Adobe Sketch iPad app, which I'm liking quite a lot. This sketch was made after getting a Tweet from my creative friend Cathy Hunt, who, although she may not even realise it, provided a large part of the inspiration for this whole Daily Create project. 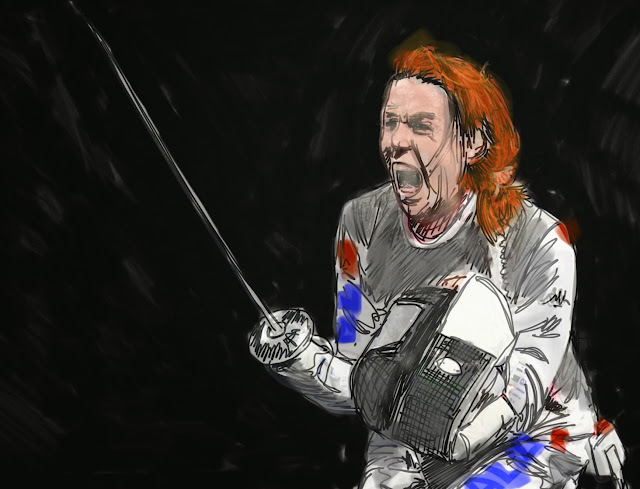 As well as being super creative with iPad art, Cathy was also a world class fencing champion. Engarde! Day 221 - Today we went on a foodie tour of Sydney's "Little Vietnam", Cabramatta. A friend of a friend is starting a business there taking people to some of the lesser known but higher quality restaurants in the area. The food was really good, and it was interesting to learn a little about Vietnamese culture and food along the way. As we wandered through the markets (there were a lot of them!) 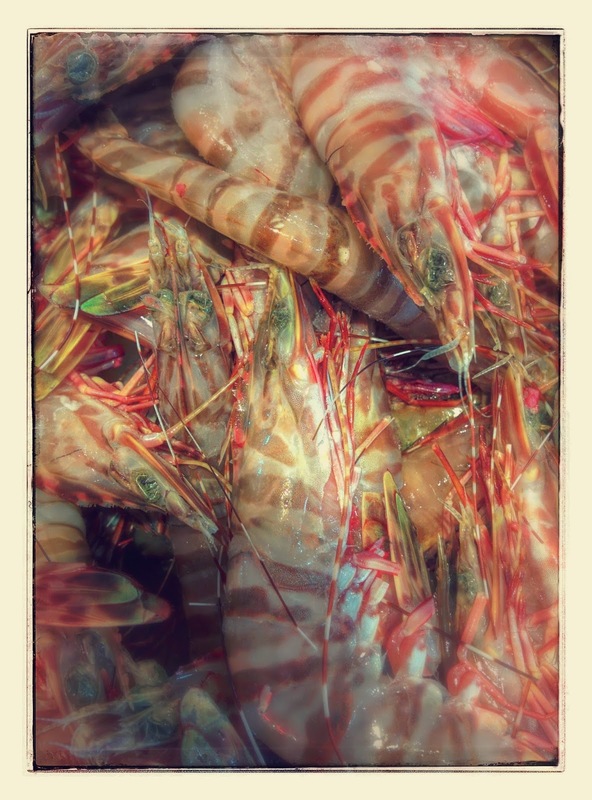 I snapped this photo of some tiger prawns, and Google+ automatically applied an auto-awesome effect to it that I quite like, so I'll claim it as today's daily create. Day 220. 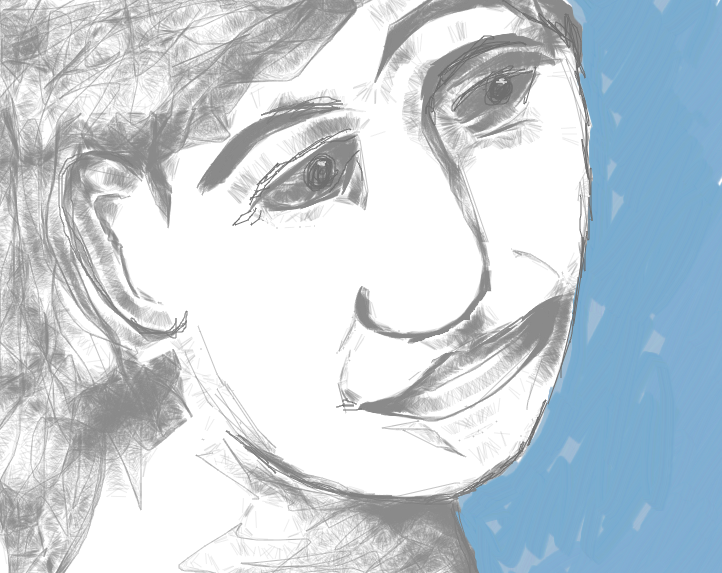 Today's create was made using a completely web-based sketching tools called YouiDraw Paint. It runs in Chrome, no software to install, making it ideal for classroom use. It also integrates directly with your Google Apps account. It has a number of different pencil and brush tools, and I just plugged in my Wacom tablet and knocked out this quick sketch. It's amazing what can be done in-browser these days. Thanks to the Google Educast for putting me onto these YouiDraw tools. They are pretty cool. Day 219. 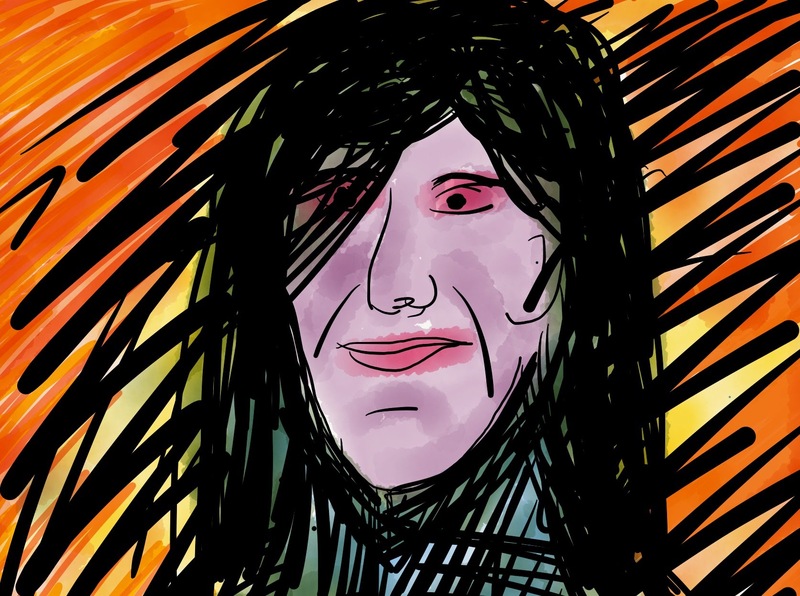 I'm fascinated with the online drawing tool YouiDraw Painter. 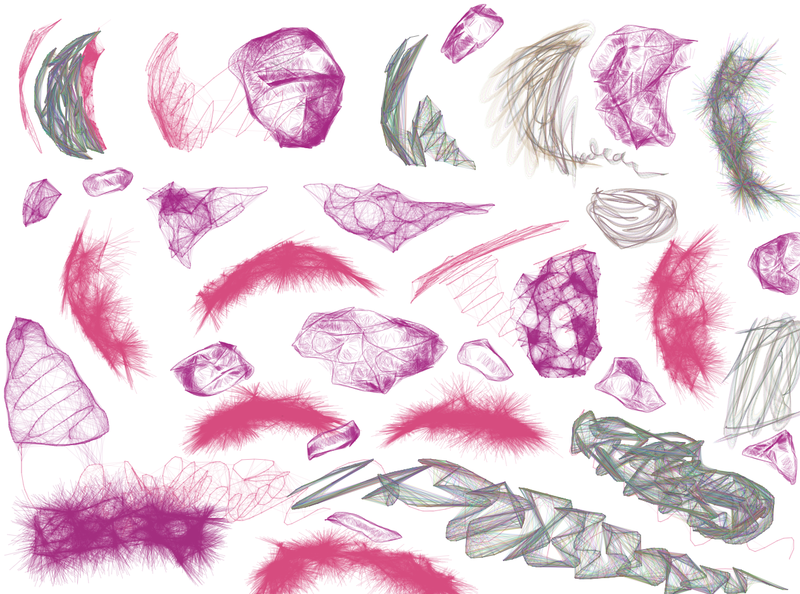 It's a drawing tool that runs in the browser and I think it has some really interesting brush types. It's obvious that it can't do a really accurate copy of an analog brush/pencil, but it applies maths in a very interesting way to give some quite curious effects. 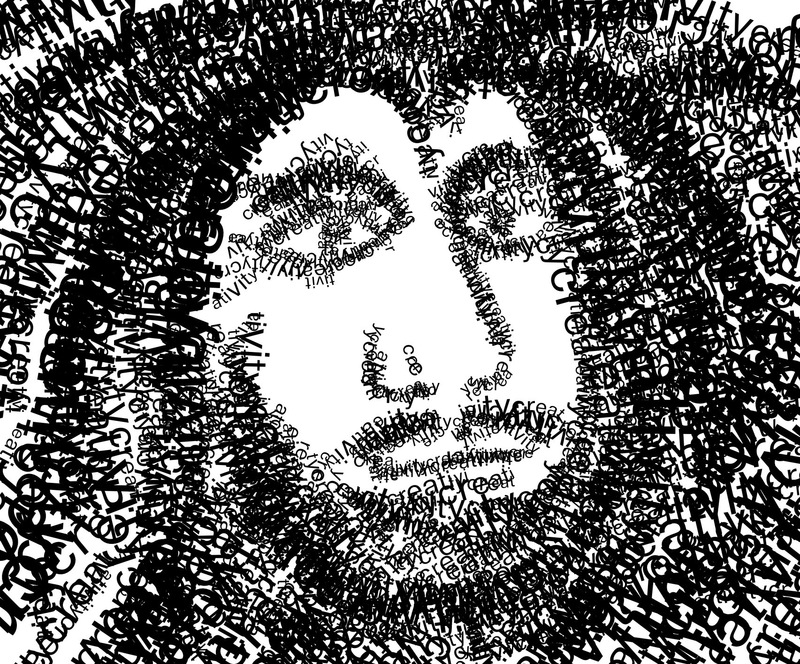 In this example i just spent some time exploring the various brush types and seeing the types of lines it can create. Day 218. 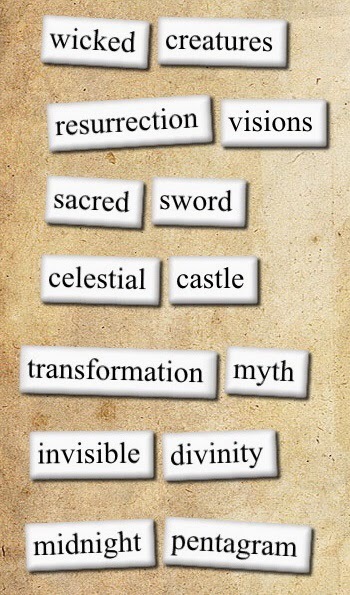 This collection of phrases was made using an app called PoetryMagnets, which is similar to other poetry generation apps I've used. I don't like this one as much though as it doesn't seem to offer any of those small joining words that help put other words into sentences, so all. Ended up with was these disjointed phrases. But it could be useful as a story starter, giving students a set of phrases like this and building a story around them. Day 217. There are a lot of stupid rules out there that have no basis in logic or common sense. Don't ever be afraid to break them. Made in Chrome with YouiDraw Paint and a Wacom Intuos 3 graphics tablet. Day 216. This piece was made with an app called Visual Poet, which lets you take three images and arrange them in a panel, then add simple text phrases to them. I recycled these faces from a previous daily create and added the phrases to them. The text is a little dark, no idea where it came from in my head, but it juxtaposes sharply with the brightly colored images I think. Day 215. More messing about with Paper by 53. Sometimes when I play with these sketching apps I start by making a few scribbles on the page and then just seeing what becomes of it as I add more. This face just emerged from those scribbles. I wonder what all this says about my subconscious mind? 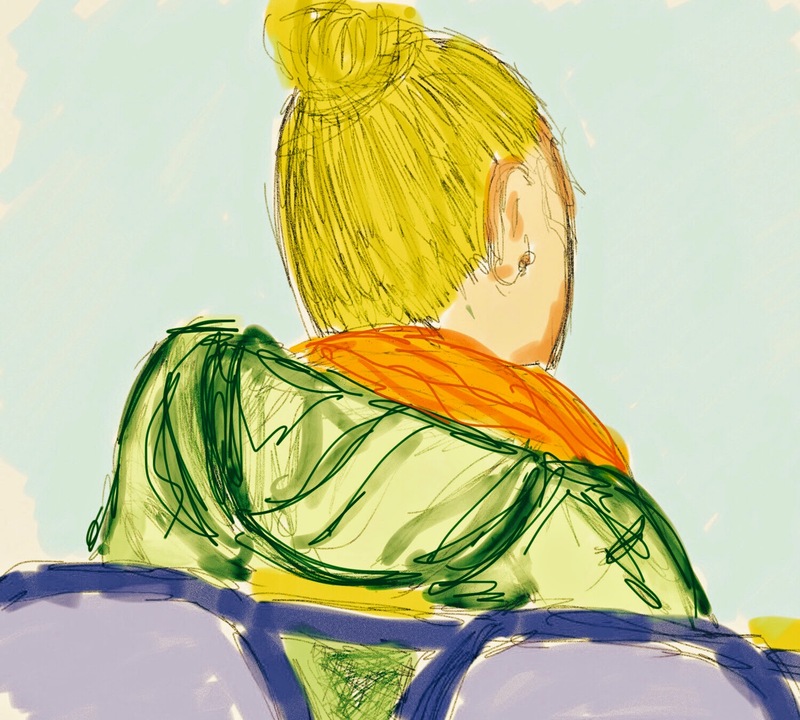 Either way, I do quite like the particular graphical quality that the Paper app seems to offer. Day 213. While I was waiting at the Orange County airport today for Kevin and a Juan I explored an app called FridgePoems on my iPad. Basically it gives you a bunch of cards with words on them, which you then have to try and arrange into sentences to form poetry. It's harder than it sounds, as the words are selected for you and you only get a limited number of conjunctions to work with. And nouns, verbs and adjectives too! 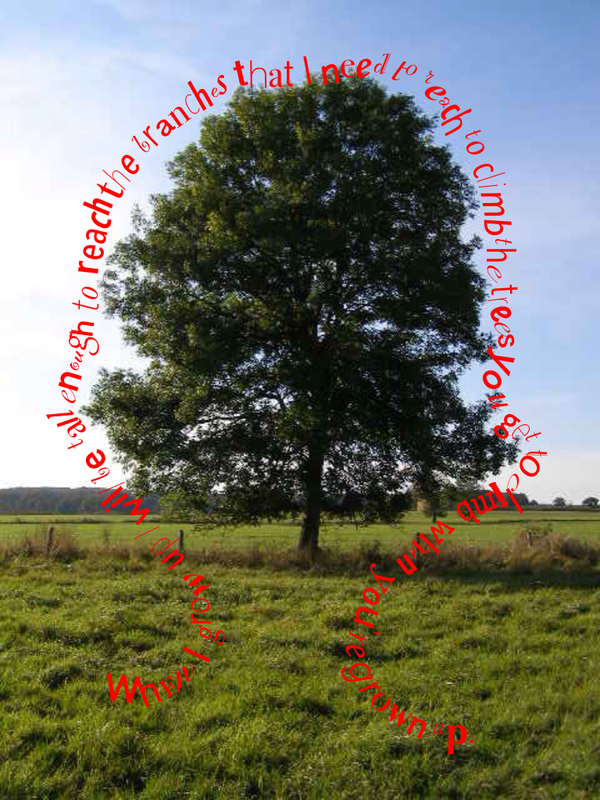 Here's my first attempt at constrained poetry ... What could your students come up with using this idea?